I really, really love things the come in mini form. Especially when those ‘things’ are food, and mini means bitesize. Not only are they the cutest ever, but they’re also quite delicious. Need some bite-sized party food? These are the ticket! 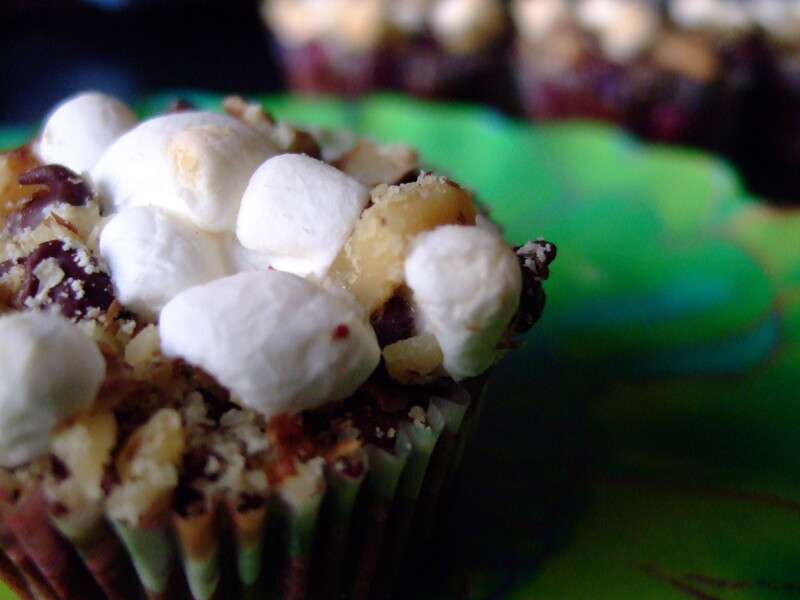 I used a browned butter brownie recipe and topped it with chopped walnuts, super mini mallows, and mini choco chips. Heat oven to 350 degrees and line mini muffin pan. Melt butter in medium saucepan over medium heat. Continue cooking, stirring often, until butter stops foaming, and the butter begins to appear brown. Remove from heat. Immediately add sugar, cocoa, water, vanilla, and 1/4 tsp. salt. Stir to blend, and then let cool for 5 minutes. Mixture will still be hot, but add the eggs one at a time, combining thoroughly after each addition. When mixture looks thick and shiny, add flour and stir until blended. Mix vigourously 60 strokes. Stir in chopped walnuts. Scoop batter into prepared muffin tin using 2 spoons, or a 2 tsp. cookie scoop is the perfect amount. Leave at least 1/4″ from the top so you have room for the topping. At this point, the brownies should not be 100% baked. Pull your pan out and sprinkle your mixture of chopped walnuts, semi-sweet chocolate chips, and marshmallows evenly over the top of your brownies. You can be very generous with the topping, it will only make the brownies more delicious! Put your pan back into the oven for 2 minutes. Keep an eye on them though, you don’t want to burn the mallows! I’ll try these for sure. Mini’s are great…even in cars!